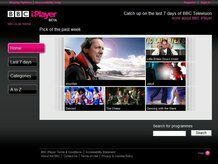 The BBC will live stream BBC One and Two online from 27 November using its iPlayer service. Several channels are already being streamed, including BBC News 24, BBC Three, BBC Four and the childrens' channels, and their success has prompted the addition of the gems in the BBC crown. Jana Bennett, director of BBC Vision, said: "The launch of BBC One and BBC Two online completes our commitment to make our portfolio of channels available to watch on the internet. "From 27 November licence fee payers will be able to watch BBC programmes, live, wherever they are in the UK on their computers, mobile phones and other portable devices." As with any 'live' broadcast, people who want to take advantage of the new streaming medium will need to have a licence fee to watch them. As the Register points out – regulating this would presumably be a bit of a nightmare for the licensing authorities. As long as you have a valid TV licence you will be able to watch the streams from where ever you like - as long as it's in the UK.